Louis Jacques Mandé Daguerre (1787-1851) was a painter and stage decorator. He was a student of Degotis, who was a creator of stage settings at the Paris Opera, with whom he started at the age of sixteen. He continued with Pierre Prevost (1766-1823), a specialist of panoramas, which are those huge circular decors painted upon the walls of a rotunda and exposed to the view of spectators placed in its center. While Daguerre’s works exhibited in the art shows never had any big success, the sets he realized from 1817 to 1822 for shows at the the Ambigu Comique or the Opera brought him unanimous praise from critics and public. He displayed original creativity with his light effects, creating moon rises or moving suns that remained in people’s memories. 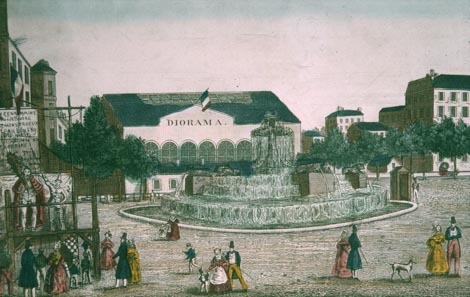 He then carried the art of stage setting to a fully fledged show, associating himself with another Prevost student, Charles Marie Bouton (1781-1853) to create a show by the name of Diorama. In 1824, Daguerre was elected Knight of the Legion of Honor. He had learnt how to use a camera obscura with Prevost, who used it to prepare his huge trompe-l’œil canvases. 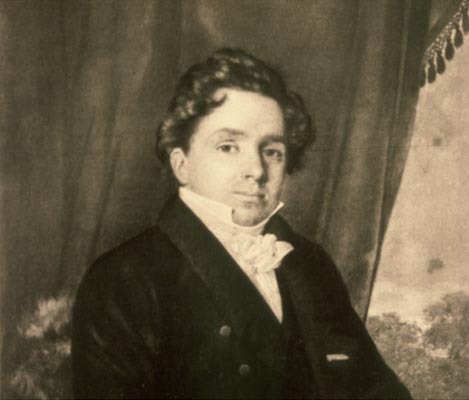 the optician that supplied Daguerre was Vincent Chevalier, who was also Nicéphore Niépce’s supplier. As a matter of fact, Daguerre got Niépce’s address from Chevalier. Besides, Daguerre was developing his lighting talents, acquired during his years as a set designer at the Opera and the Ambigu, to change the mood of a same scene. This created such an illusion of reality that the Diorama became a huge success. Later on, the two partners adapted to these huge sets the principle of showing the optical views either with front or back lighting. 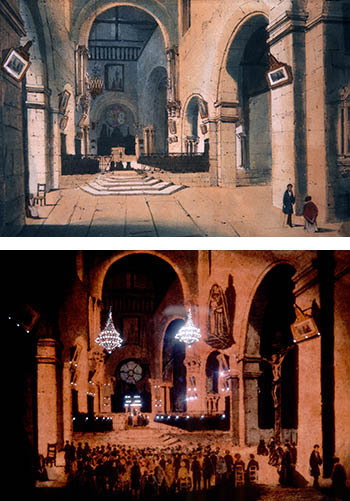 In this case the scene watched with a dim lighting, whence a night effect that could be accentuated by painting to the back of the view a decor with the purpose of masking some parts of the image creating new shadows corresponding to night. Going from one to the other lighting, the same scene would progressively change from day to night . Daguerre’s Diorama: Day and night light effects. The Diorama was very impressive to its viewers. The room was 12 meters in diameter, and could be occupied by three hundred and fifty people. Rotating, the room was placed in front of an opening that was 7.5 metes wide and 6.5 meters high — a sort of a proscenium, the sides of which flared out up to the famous painting, painted on both faces, and which measured 14 meters in height and 22 meters in width. Then the show would start. After the painting big frames with glass panels permited back lighting or transparence lighting, other frames from the flies gave overhead and front lighting. Displaying in front of these frames translucid pannels of different color and motioned by ropes, the general or local tone of the tableau could be changed, producing on the whole tableau or parts of it some effects ranging from thick fog to bright sunlight. The show lasted about fifteen minutes, after which the room rotated again and progressively was turned in front of a position similar to the first one set into the room circumference. A new tableau was offered to the spectators and fifteen minutes of animation by light works could start. In December 1827, Daguerre met Niépce in Paris on his way to England. The two men got along together. Niépce was fascinated by the Diorama. 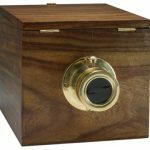 Daguerre too had had the idea to capture the images of the camera obscura. For this purpose, he put phosphorescent powders at the back of his camera obscura. The image projected on this powder remained visible for a few hours, then slowly faded away. 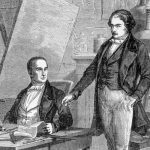 The two men met again on Niépce‘s return from England in February 1828. 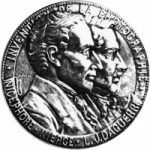 They started to exchange ideas by mail and in 1829, Niépce suggested to Daguerre to create a partnership to contribute to the development of the invention of heliography. 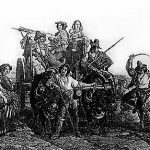 The contract was signed in December 1829. Daguerre put a lot of work into the process and thus, in 1832, the two men invented a new process together: the physautotype. After Niépce’s death, Daguerre alone kept on researching how to take images and invented the daguerreotype, a photographic process which was easier to put into practice, since exposure times were only of a few minutes. The daguerreotype knew a huge success and made Daguerre world famous. After his retirement in Brie-sur-Marne, Daguerre died on July 11th, 1851 .